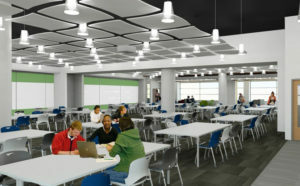 The HSLC improvements include a new Active Learning Center. The Facilities Group is overseeing the Health Sciences Learning Center enhancements project, which includes renovations and improvements to about 365,000 square feet of space. The improvements are divided into two projects. The first phase includes remodeling classroom and teaching space. This phase of the project will be completed by the time the Liaison Committee on Medical Education accreditation reviewers arrive for their site visit in April 2018. The second phase, expected to take place between May and August 2018, comprises reworking the office space and staff conference areas throughout the building. The UW-Madison Facilities Planning and Management Website includes information on capital projects, space, physical plant, planning, safety, parking and transportation. Campus Renovation Services functions as the single point of contact for students, faculty, and staff who require small remodeling and construction projects in UW-Madison campus facilities. The State of Wisconsin Department of Administration (DOA) Division for Facilities Development (DFD) provides leadership, coordination and technical advice for the State of Wisconsin’s facilities. The University of Wisconsin System Capital Planning and Budget group performs planning for large gift and grant-funded projects.